As the days draw in and the nights get longer, we're bound to spend more time cooking up comforting autumnal treats in our kitchen. 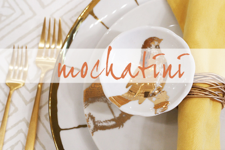 Plus, as the holiday season approaches many of us will be entertaining all the more - and no doubt the kitchen will become the heart of the party. 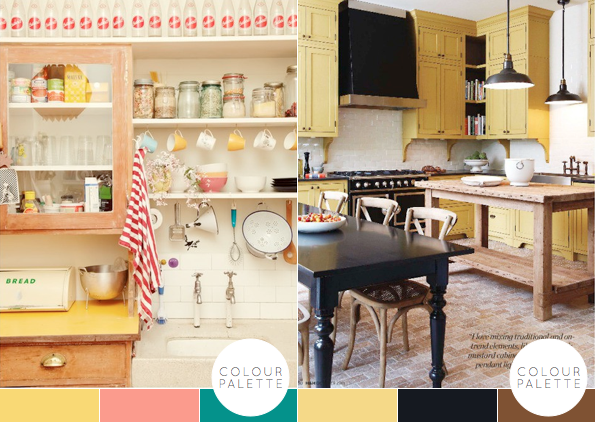 I felt inspired to pull together different schemes that use yellow to make a kitchen brighter and more colourful. These five schemes show how the sunny hue can create a stylish and welcoming space whether prefer a modern, rustic or vintage-country aesthetic. 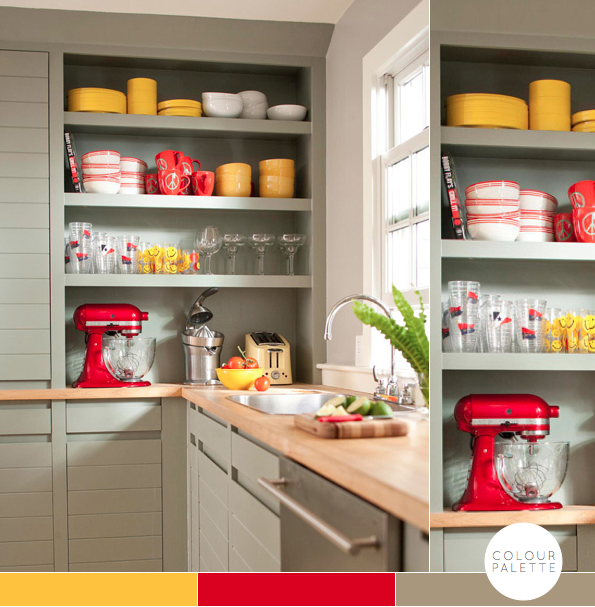 I'm especially loving two of the schemes: the sage grey cabinetry and shelving of scheme three appeals to my masculine side, while the oh-so-welcoming, country-cottage feel of scheme four and its well styled open shelving has me hampering after my country roots. Which one gets your vote? I love yellow, what great inspiration on how to use it in a room, thanks! I love it with the dark grey shelving. I really love a grey and yellow colour combination lately! 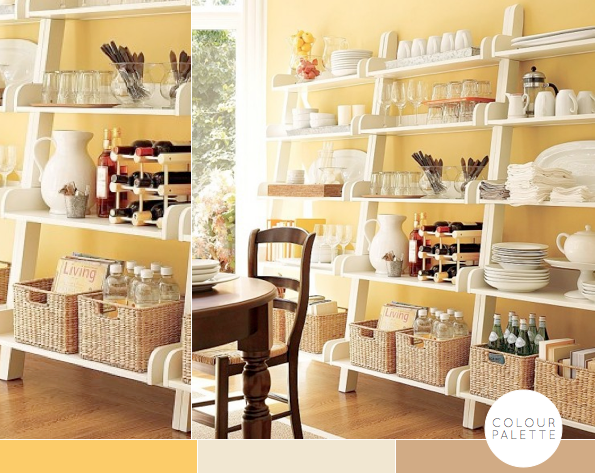 I love the soft pastels in the second last one, not to mention the kitchy details. Beautiful! I LOVE the first picture - stunning colour palette. I feel like I've always been a bit afraid of the color yellow... but this is definitely making me want to try it! I need absolutely no persuasion to throw yellow in anywhere! And for one of the first times I'm mad about it mixed with red, as you've shown. Gorgeous! Oooh I love friendly yellow! Especially that friendly yellow kitchen. Very cute! Oh vintage+modern and COLORS! I'm going to be the happiest person in the kitchen! 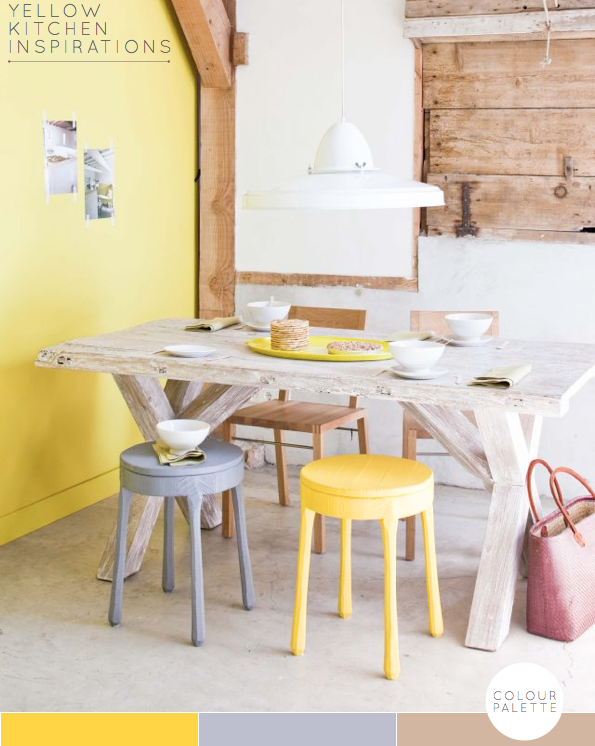 It's lovely, I'm not sure yellow would work for me but I really love the first image with the white washed wooden table and the beams. I'm going for the top one, hands down. Love it! The red, yellow and gray color palette is my favorite, hands down! It's a very fresh color combo! 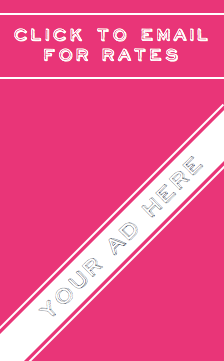 The best color. Cheerful and uplifting, always.